This next tip comes from Kaibeezy who writes: now, that's something you don't see every day - in fact, i'm certain i never have in all my months and years of dredging CL for you. claimed 32k miles - dope wheels... dopey i mean. 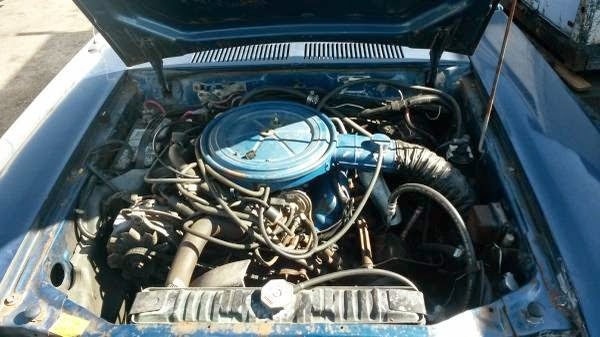 Find this 1977 Mercury Bobcat offered for $1700 in San Leandro, CA via craigslist. The Bobcat was a rebadged version of Ford's subcompact Pinto -- known around the world for its exploding fuel tank, which was a smear job from some two bit rag called Mother Jones..which I have determined through exhaustive research is not owned or produced by Tom Jones' mother or any member of the Jones extended family. Under the hood is Cologne V6 mated to an automatic transmission that pushes out a whopping 93 horsepower and 140 ft-lbs of torque from its ample 2.8 liter displacement. Agreed! Don't see many of these around. I have a soft spot for Bobcats & Pintos. I had a few. Gotta resist. 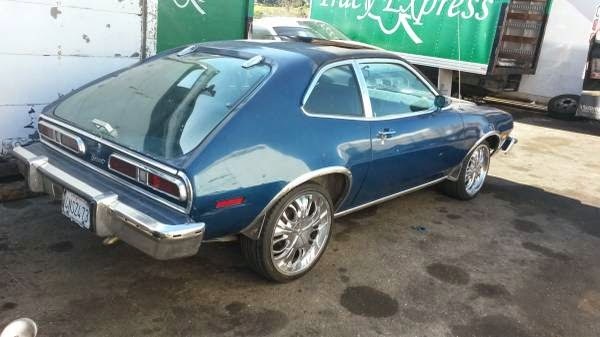 Because of Mustang II suspension kits, super large brakes, drop spindles, and Mustang II rear ends you could easily mod a 74-80 Pinto into awesomeness. Or at least in my twisted mind. The Pinto and Vega were a fascinating contrast. 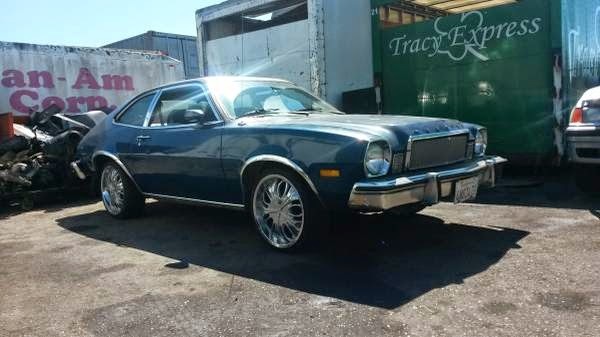 The Pinto was a really horrible design, but the mechanical bits were tough and proven and it didn't seem to rot out too quickly by Detroit standards of the time. The Vega was a great design, but we all know about the mechanical issues. Maybe not a Plymouth Cricket. Little by little Ford added pounds to the Pinto, and buy the time they pushed this thing out the door it was carrying the full 3200lb Mustang II mechanical package including stupid bumpers and the V6 with tons of iron accessory bracketry and - believe it or not - the same 8in rearend Ford had been stuffing in everything they built in the '60s, though the ends were shrunken to fit the Mustang spring pads. This is one of those cars where the individual parts are, potentially, far greater than the sum. That rearend is halfway useful in other applications, the V6 likewise, the front end maybe too, but the overall package itself deserves to be Chinese razor blades. The track width on those 8in Pinto/Bobcat/Mustang II rearends was exactly the same as the '65 Mustang, for anyone who cares, though the axle ends and spring pads were different and the bearings were smaller. Which just helps illustrate how unreasonably out of proportion these things were to the market they needed to sell into. ...I saw that rear glass. That piece looks to afford a big, beautiful view-which, of course, would be the most attractive image associated with this thing. In that hypothetical crapcan garage I call my cerebrum that backlight would be carefully removed and hung somewhere I could see it, replaced with a lexan substitute, and serve me for years as industrial wall art. Ha ha! Or maybe a solar panel for your house! In the crapcan world, you remove and sell the whole hatch and whatever you get for it goes back into suspension and drivetrain. Would be better looking without those massive bumpers on it. These gained weight in part due to all the extra structure that had to be added so they wouldn't explode upon being rear-ended. I admit I never knew these existed. Classy version of the Pinto? Here is why you need a Pinto. My 6'2" wife and I had a good time on a road trip with Grandma in about 1979. I was folded up driving and the wife was folded up in the back seat, while Granny just chatted away... Great memory of a not too great car trip. Hoogolly. I just got home and actually saw the wheels on this Bobcat. Ouch those are fugly.